The third file has just come in so please go straight through for assessment. Its taken this long due to the seven departments that had to review it first after it got stuck in Tblisi airport. Don't leave it on the train this time or Morris will have to be informed. This is just a little drawing of an animation I saw today Mr Hublot (2014) - its only a short but apparently it won some awards; its really good, check it out. I've been neglecting this site lately for which I apologise... I am going to try to post something every day or at least every few days, as its good for my morale. September can be beautiful but it can also be a bit of a post summer malaise: happy days. Tex Avery knows what I mean. Anyway enjoy the changing colours and seasons and don't let the bastards grind you down, or the care bears. Watch out for the care bears, those vicious condescending furry gits. PS Batman the animated series is officially the best cartoon I have ever watched in my entirely important variety and luxury filled life. It's been said to me before but until you experience it for yourself its just words. Useful words that inform you that batman the animated series is a good and wholesome way to spend your time. A macrophage is shown surrounded by red blood cells. The macrophage is engulfing and consuming the cells in a process known as phagocytosis. Red blood cells can't repair themselves so live on average for 120 days before being 'eaten'. I tried to perfect the circular motion as much as I could yesterday, but today I took it in hand and gave it a good spanking. The full penance would be to have a runner and a walker moving side by side but I am resting today. Crazy yeti with no clothes will however wander in a circle forever as we the viewer are compelled to have a double take until we look away. day 5 of draw something every day. I have animated again, instead, which is drawing lots of things. You know those hamster ball things. Tom cruise: ideal movie. (Animating again after long hiatus.) I am a wicked wicked giantess. There must be a pair of shorts along the way somewhere. You may look at him more closely by clicking on the window he is running in, if you care to do so. Some sketches from yesterday and the animation I have been working on for about a week. It took 143 sketches, I didn't go for the full 900 but I was using my new graphics pad! To see the animation you can find it on youtube under my tag Ttiaat or just go to this site here. Did you click the link in the last post? Well, did you? Here is the very first design. 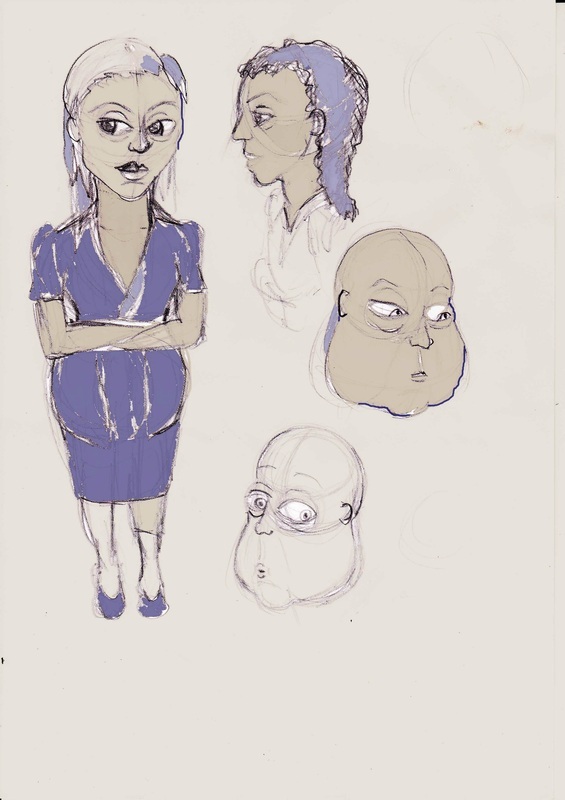 I first drew this character on rollerscates when designing Benoit the detective - she is his companion. There is a plot I have in mind where they put a stop to 'baby face' Tony's wretched tantrum-tastic ways. Maybe I will get round to animating the story some day.